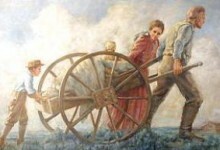 When it was discovered that the Martin and Willie Handcart Companies were in trouble, Brigham Young immediately called upon the members of the church to provide assistance during the morning session of General Conference. There was no time to prepare. Men, women, and children were starving, freezing, and dying on the plains. Women stood up in the Tabernacle and removed their petticoats, gloves, hats, and other items and donated them right then and there. Men left the conference to get their wagons and teams of horses ready. Brigham did not wait, he sent the rescuers out that very day. So many people gave all they could to save these strangers and assist them in making the last few weeks journey to Zion. So many heroes gave so much, and risked their own lives. One individual by the name of Reddick Allred risked his own life to save others, but his heroism is not found in what he did, but what he didn’t do. Brigham’s plan was to set up ‘stations’ between Salt Lake City and the area where the handcart companies were. As the handcart companies approached a station, they would be given supplies and support to help assist them to the next station. Riddick Allred was assigned to lead a group of men in overseeing a station at South Pass. South Pass sits at the highest elevation of anywhere on the trail. He arrived at South Pass on October 19 and endured the brutal winter storms which never seemed to end or dwindle in strength. One October 23, 1856, the Rescuers helped the Willie company over Rocky Ridge, which was East of South Pass. It took the Saints 27 hours to climb the 15 miles over Rocky Ridge when temperatures were near zero degrees and there was 18 inches of snow on the ground. The struggle would cost 15 people their lives. Reddick Allred was sent for. He was to travel 15 miles to where the Willie company now was (Rock Creek Hollow) and provide support. He took with him flour, beef, and other supplies. After helping the Willie company get back on their way, Reddick was instructed to return to his station at South Pass and wait for the Martin company. At this time, the Martin company had not yet been found. How long Reddick would need to wait was unknown, but he returned to South Pass to wait. For three incredibly long weeks, Reddick waited at the South Pass station, experiencing freezing temperatures, hunger, and now illness. Many men abandoned their assignment and returned to the Valley claiming that either all of Martin’s company was dead, or they as rescuers would die waiting for them. Prior to abandoning their duty, the men asked Reddick to seek the Lord’s will to know what to do. Reddick said, ‘To this I objected as the Lord already said what he would have us do’. Reddick Allred refused to budge. Brigham had sent them out, and as their priesthood leader had told him to wait there. When the others abandoned their duty, they took several wagons and much need supplies with them. Even more tragic, they encouraged each rescue wagon they met on the way back to Salt Lake to likewise turn around. They turned back 77 rescue wagons!